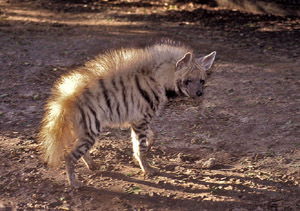 The striped hyaena (Hyaena hyaena). The Arab word for striped hyenas, dhubba, is alluded in a valley in Palestine known as Shaqq-ud-Diba (meaning “cleft of the hyenas”) and Wadi-Abu-Diba (meaning “valley of the hyenas”) and the species has an important place in middle-eastern cumap of Turkeyltural history, where it is still found today. However the species is widely persecuted, and the situation is critical in Turkey where the last remaining individuals of this species are found in the far east of the country. There are no comprehensive population monitoring studies. 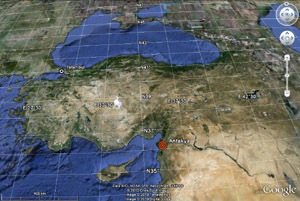 Our partner in this project was İsmet Ceyhun Yıldırım, a forest biologist and engineer, based in Sütçü İmam University, Kahramanmaraş, Turkey. He had just finished his masters in Wildlife Ecology and Management under the supervision of Prof. Dr. Selçuk İnaç, at Faculty of Forestry. In 2009 we were awarded an inaugural grant from the Mohamed bin Zayed foundation in Abu Dhabi to conduct an assessment of the utility of FIT for monitoring this endangered species. We found many footprints in and around caves inhabited by this shy hyena, and set up infra-red and incandescent light camera-traps with prepared sand areas baited with fishmongers waste. We interviewed local trackers and approached local schools to establish an educational programme to raise awarenesss of the plight of the striped hyena. We are now working with colleague Asaf Ben David from Tel Aviv University with an Israeli population of striped hyena to augment the number of footprints in this project.